Background: Accumulating experimental studies have manifested that long-non-coding RNAs (lncRNAs) play an important part in various biological process. It has been shown that their alterations and dysregulations are closely related to many critical complex diseases. Objective: It is of great importance to develop effective computational models for predicting potential lncRNA-disease associations. Method: Based on the hypothesis that there would be potential associations between a lncRNA and a disease if both of them have associations with the same group of microRNAs, and similar diseases tend to be in close association with functionally similar lncRNAs. 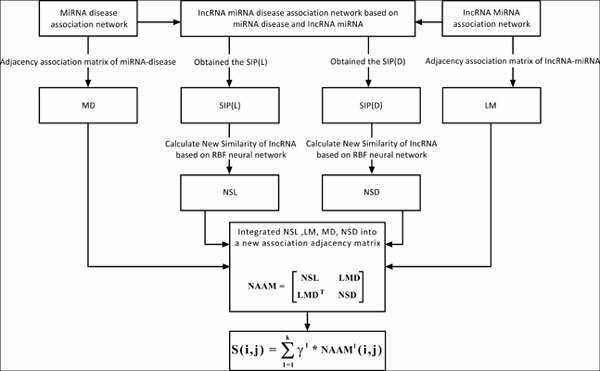 A novel method for calculating similarities of both lncRNAs and diseases is proposed, and then a novel prediction model LDLMD for inferring potential lncRNA-disease associations is proposed. Results: LDLMD can achieve an AUC of 0.8925 in the Leave-One-Out Cross Validation (LOOCV), which demonstrated that the newly proposed model LDLMD significantly outperforms previous state-of-the-art methods and could be a great addition to the biomedical research field. Conclusion: Here, we present a new method for predicting lncRNA-disease associations, moreover, the method of our present decrease the time and cost of biological experiments. Keywords: Similarity， computing model， prediction, lncRNA-disease associations, LncRNA-MiRNA-disease interactive network. Keywords:Similarity， computing model， prediction, lncRNA-disease associations, LncRNA-MiRNA-disease interactive network. Abstract:Background: Accumulating experimental studies have manifested that long-non-coding RNAs (lncRNAs) play an important part in various biological process. It has been shown that their alterations and dysregulations are closely related to many critical complex diseases.